The world, it’s been said and oft-repeated, is a stage. I too am one such a player – a masked pretender cued by the reflection my audience mirrors back to me. But I am also a writer – one who has further played the role of poet, at one time or other. I have characterized my own self, as well as my personal stage where the show goes on. I always appreciate characters who can seamlessly fit themselves into any circumstance alongside others, for I’m not always so seamless in my own life, and often feel the need to pretend to be someone else to navigate situations effectively – something I’ve over the years come to refer to as pulling a rabbit out of my hat. The origins of my rabbit-out-of-my-hat analogy – all but forgotten until the sudden return of the turn-of-phrase to a written state, whence it began, was poem I wrote back in 2006 during my angsty late-20s. As I have slowly been resurrecting my old poems as situations warrant, so too am I now giving this one new life. 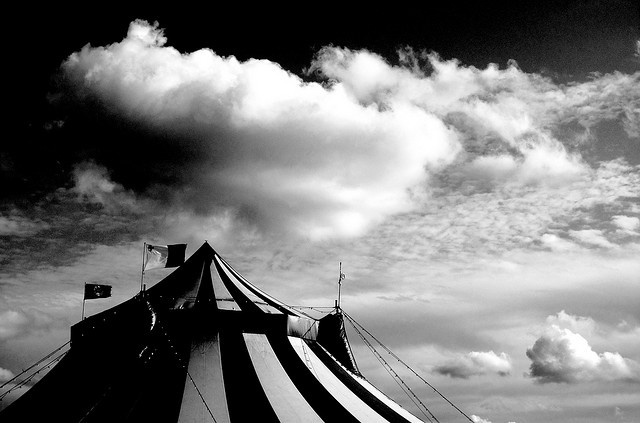 A life – as I envision mine – under the Big Top. Barely sharp enough to break the skin. Yet here I am with my head in the mouth of a lion. Here I am playing with fire. This entry was posted in Poetry, Writing and tagged Characters, Circus, Introspection, Writing inspiration. Bookmark the permalink. People often hold us in far higher esteem than we hold ourselves. I’ve found this out a number of times over the years. This is probably one of those times for you. I’m curious. Was the target of your poem a real person, or people in general? 2) To not be stinting in my praise and esteem of others, and rather than fearing coming across as weird or fawning or whatever, to always honour the feeling (and the person) by expressing it. When I first wrote the poem, I had a specific person in mind. But as I was rewriting it to post, it shifted in my mind to be about all people in general, and that’s the way I now interpret it. I’ve never heard of this video before but I’m sitting here listening and thinking ‘where has this music been all my life!’ it’s beautiful. Dead Can Dance is a wonderful group, Dianne, formed in your neck of the woods (Melbourne) in 80s before relocating to London. The group combines two of the most distinctive singing voices I’ve ever heard, those of Lisa Gerrard (who you might recognize from the haunting soundtrack to the movie Gladiator), and Brendan Perry, who sang the lead on this song. Another Perry-led song (this one more upbeat) from this same album (Into the Labyrinth) that I really like is called “The Ubiquitous Mr. Lovegrove”; you should YouTube it.